8:00 a.m - 4:00 pm with carts off the course by 6:00 pm. At The Links of Naples, the fun doesn’t stop at sunset! We are certain you’ve read many descriptions of golf courses; challenging yet fair, great for all levels of golfers. This par 61 course was built to give a good test of golf on an executive length course. 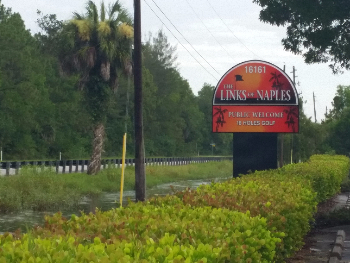 Do all levels of golfers enjoy the Links of Naples? Golfers consistently tell us how much they enjoy playing the course, and yes the long hitters of the golf world enjoy playing The Links of Naples too. The condition of the course is fantastic and consistent. The atmosphere is comfortable and the price is affordable. A beer and sandwich after a round of golf won’t break the bank. It’s fun. Pure and simple. And it’s not just fun under the sun. Play under the lights and enjoy golf in a whole new light! At the Links of Naples, the fun doesn’t stop at sunset. General Manager Scott Allen and his entire staff are looking forward to seeing you soon. Call 239-417-1313 to schedule a tee time. Click here to join our email club to stay in touch and take advantage of unadvertised specials throughout the year. And remember to like us on Facebook!